Sweet potatoes (well, technically yams) are one of my favorite foods. I eat them as often as I can. 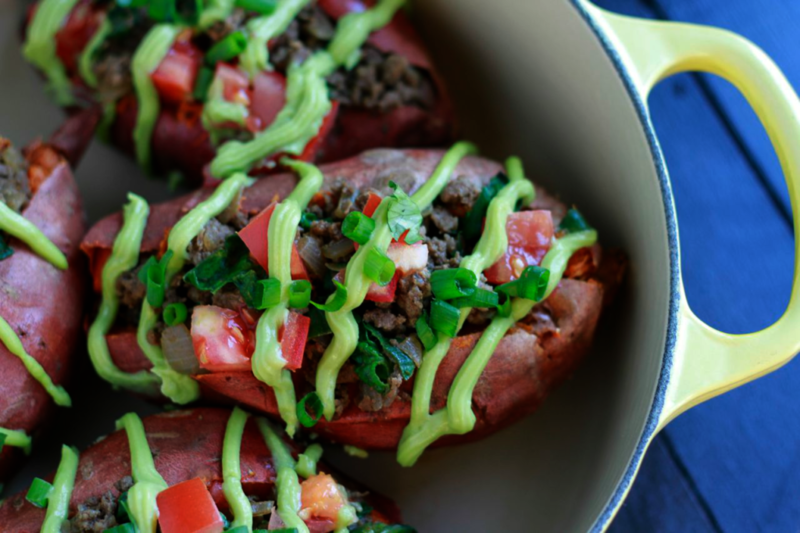 Imagine perfectly baked sweet potatoes loaded with deliciously spiced ground meat, avocado, tomato, and cilantro. Yes, that’s what’s for dinner tonight at our house. 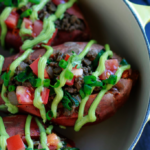 My kids love stuffed baked sweet potatoes. It’s fun to load them up with whatever yummy goodness you want. It makes for a hearty, satisfying meal that everyone can enjoy. Add a fresh green salad or steamed greens, and you are good to go. And you can feel good about your family macking down on these delicious creations as sweet potatoes are some of the healthiest foods around. I consider them an amazing SUPERFOOD because they are loaded with nutrient-dense goodness. Sweet potatoes (or yams) contain approximately 30% of your daily vitamin C requirements. Yams are also rich in Vitamin B-complex, especially B6. B vitamins are essential for your body to regulate stress and mood, along with many other metabolic functions. Because of the fiber and carbohydrate content of yams, they are an excellent source of long-lasting energy. And don’t forget about Vitamin A, Potassium, Iron, Calcium, Manganese, and Copper. Oh, yeah! So, go ahead and whip these up for dinner tonight. Your family will thank you! Pierce each sweet potato several times with the tines of a fork. Place the sweet potatoes on a rimmed baking sheet. Bake until tender and completely soft, about 45-60 minutes. Prepare avocado sauce by combining all avocado sauce ingredients and mixing until creamy and smooth. Set aside. About 30 minutes into baking sweet potatoes, melt fat of choice in skillet and saute onion for 7-9 minutes until beginning to brown. Add ground meat and continue to cook until meat is completely browned. Add salt, cumin, chili powder and water to skillet. Mix to combine and cook another 5 minutes on low-medium, until water is all cooked off, stirring occasionally. Add chopped spinach and cook another couple of minutes until spinach is wilted. Cover and remove from heat. 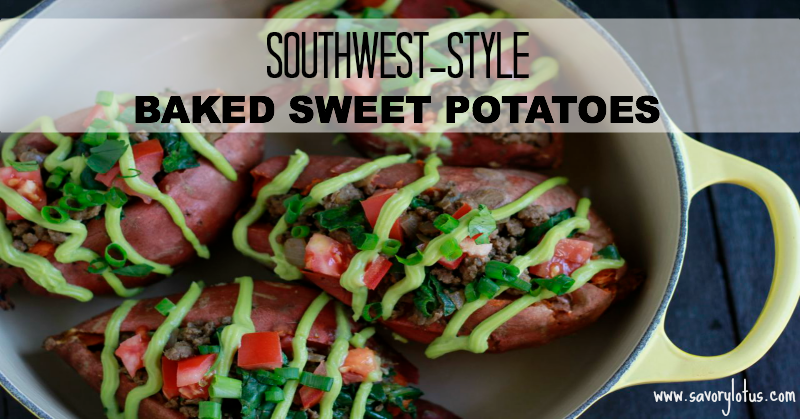 When sweet potatoes are done, make a slit in the top of each sweet potato and squeeze the ends to create a little well inside. . Gently loosen up some of the inside of each sweet potato with a fork. Then top with big mound of spiced ground meat. Drizzle with spicy avocado, and garnish with green onions, cilantro, and tomato. Serve with fresh green salad or steamed greens. Enjoy! Hi I am new to whole eating I am attempting to switch from my favorite processed food like products to natural whole foods. 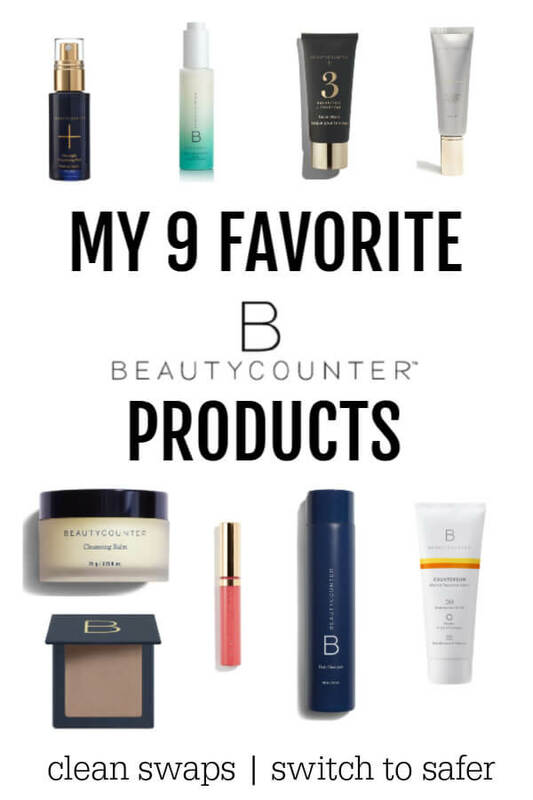 I came across you blog by accident and am so glad I did. I made these potatoes and they are so yummy my sauce is not nearly as pretty as yours delicious but a tad mushy. 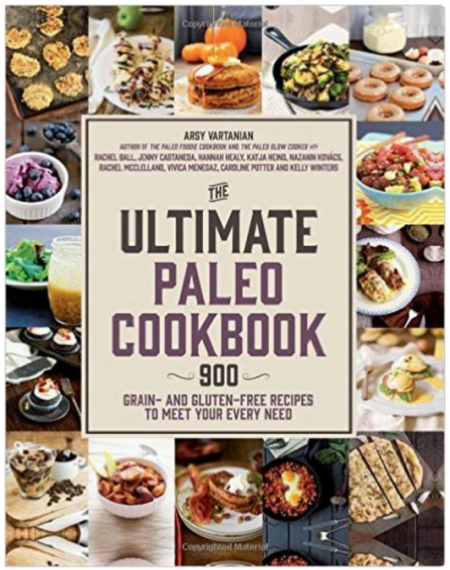 I cant wait to try more recipes. These were amazing!!! Definitely a keeper. I am normally not a huge fan of cumin/chili flavors so I nearly divided their amount by 2. They were not overwhelming this way but still very present. I also loved how appealing this meal is visually, with the bright orange of the sweet potato, the soft green of the avocado sauce and the brown/dark green of the meat mixture. Thanks for the feedback. Glad you guys liked them. A family favorite around here , for sure. that is so awesome! My family loves these. 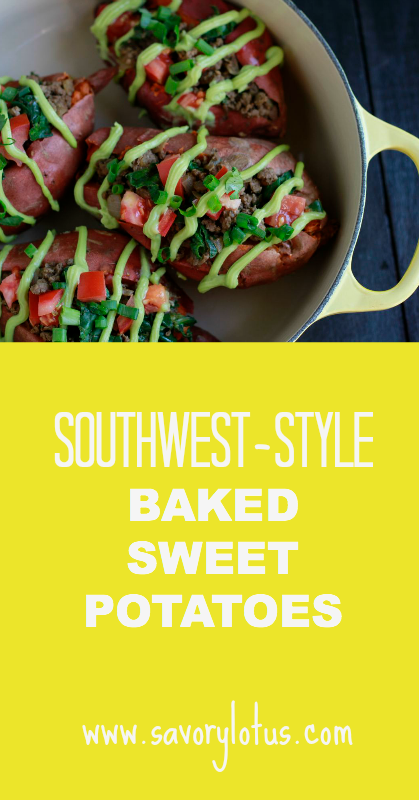 Sweet potatoes are a favorite around here as we don not eat grains. Isn’t it nice when they all love a meal you make?